The Friends email account is still down, so race recaps again come from my Dartmouth account. They follow a preview of this weekend’s racing. The WOMEN are off this weekend in preparation for their Eastern Sprints. “This was our last race before the Sprints, once again away from home. All this travel has been tiring, but we do some of our best thinking on long trailer drives. During the 7-hour trip home from Philadelphia we pitched an idea to the Cornell coaches: what about 2 x 2k? It would be perfect preparation for racing heats and finals at the Sprints, give us the chance to test different lineups, and make the 6 hours to Ithaca more worthwhile. They agreed and we prepared to race twice. “I love racing at Cornell. The narrow inlet is perfect for one-on-one racing. It's so intimate - you can really feel the other boat. It was fun to race six boats across during the afternoon, especially as we prepare for six boat races at Sprints. We're in a good place going into our last two weeks of training. We have not peaked yet and there's definitely more speed to gain. We just need to keep working on cementing boat feel so all crews feel confident. We're determined to achieve positive results for all of the hard work we've put in this year. “Last season, a dismal race against Boston University and Rutgers ended up as the turning point to the year. The team could have folded and lay down, but instead, they rallied around each other, stepped up their efforts, found more speed than they or I thought they could to perform exceptionally well at our championships. I have a feeling that this past weekend’s racing will be this year’s test. We weathered two incredibly long days of travel, the illness of a varsity rower, and the resultant reshuffling of all lineups before producing sub par races against very good crews. A tough weekend for the varsity. We’ll need to apply the lessons we learned from the weekend and then put it behind us very quickly as we’ll face the same crews this weekend. Captain Sandy Hull ’09 offered his take on the weekend: “The varsity team left Hanover at 4 AM on Friday. Flying to a race venue was a new experience for everyone, as was the early wakeup. We made it to the Chicago rental van pickup without delay. One of the three vans faced some navigational difficulties along the way but eventually the team arrived at the hotel in Alsip, about 40 minutes south of the city. Once there we made ourselves comfortable before a quick rig and row at the course. A long day of travel ended with a big meal and early bedtime in preparation for the coming day. The racing was held on a narrow canal just a few lanes wide. Race day saw a slight head current and a brisk tailwind. 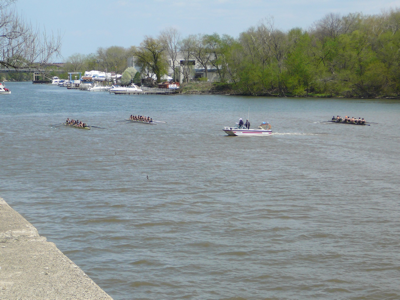 Both the varsity and the second varsity based their race plans around a big early push. Racing against Wisconsin and MIT in the morning, the varsity found itself down a couple seats on both crews off the line. The powerhouse Wisconsin crew found lead it would never relinquish while MIT also made an early push. When it came time for our surge at 650m into the race, we gained just a seat or two on MIT. Over the remainder of the race MIT and Wisconsin extended their leads while we fought stay close. Our sprint was not enough to close the gap.